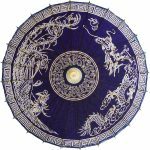 2 This striking paper umbrella features the dragon and rooster. The two creatures are portrayed in white against a dark blue background shade. This striking paper umbrella features the dragon and rooster. The two creatures are portrayed in white against a dark blue background shade. The dragon is synonymous with power, might and fierceness. The rooster symbolizes advancement and protection. 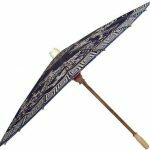 This stunning blue and white paper umbrella will make you the talk of the town when taken out for a stroll in the sun. Or, use it at home for a fine decorative accent piece.